Is anyone else ready for spring? The month of February has been cold, cold, and snowy! And looking at the first week of March, it looks like we'll have the same temps. The AMHA Convention in San Antonio was fantastic and I was so happy to meet a lot of our members and club representatives! A big thank you for the Convention's official photographer, Howie Schatzberg, whose photos are available to download for FREE! Click here to check them out! The club contest winners and promotional grant recipients were announced at the the Annual Meeting of Members, the first AMHA Star Awards ceremony was held Friday evening, and the Stallion Service Auction was a huge success, thanks to all the bidders and stallion owners. Congratulations to all! You can read all about the Convention winners below. Now is the time for club renewals! Here is the Club Renewal Application. If you aren't the correct person to receive this email for your club, please forward this email along to the proper club contact. AMHA also has a job available in the Registry Department! See below and please note the job is in our Vermont office; it is not a remote position. Til next month! Fingers crossed for warmer temps! AMHA currently has a job opening in its Registry department in its home office located in Shelburne, Vermont. Must be a team play with attention to detail; heavy emphasis on data entry and customer service. Applicant must have excellent oral and written communication skills, computer knowledge, and organization. Horse knowledge helpful. 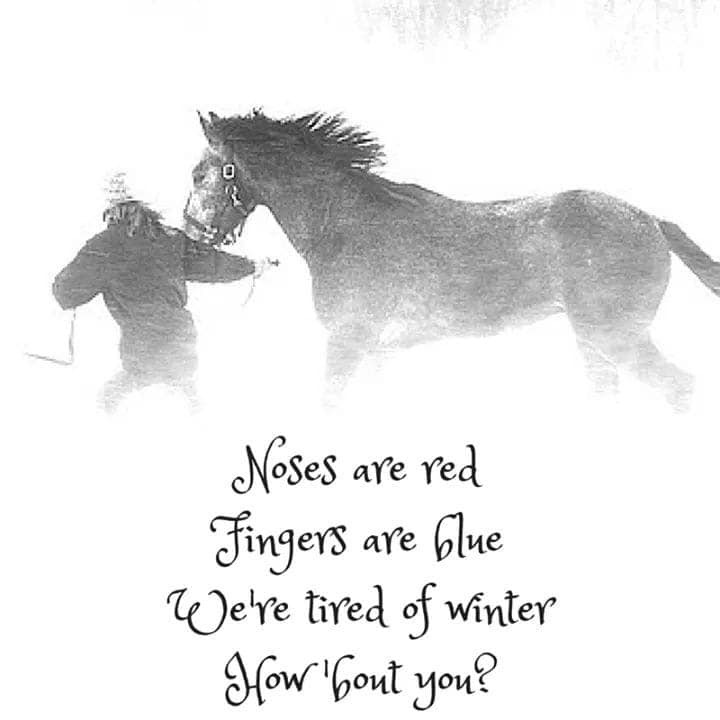 Send resume and letter of intent to erica@morganhorse.com or send to AMHA, Attention: Erica Eulau, 4066 Shelburne Road, Shelburne, VT 05482. If you were unable to attend the Meeting of AMHA Members on February 7 as part of the AMHA Convention, the 2018 Annual Report is available online and can be downloaded by clicking here. The Sacramento Valley Morgan Horse Club has been awarded as the 2018 AMHA Club of the Year! The announcement was made at the AMHA Annual Meeting of Members, which took place February 8 in San Antonio, as part of AMHA's annual convention. Clubs from across the country competed in the Club of the Year contest and were judged on their yearbooks, which chronicle the club's activities throughout the year in eight separate categories. A prize of $600 will be awarded to the winning club for their achievement. Earning second-place honors and a prize of $400 is the Wisconsin Morgan Horse Club. Taking third place was the Ozark Morgan Horse Club. In the local club newsletter contest, the Show Me Morgan Horse Club led the way and took top honors. Among the National Organizations entries, the Cornerstone Morgan Horse Inc. earned first place honors. AMHA is pleased to announce the following AMHA members received honors at its Annual Meeting of Members, which took place February 8 in San Antonio, Texas, as part of its annual convention. The American Morgan Horse Association, Inc., held its annual meeting of members as noticed on February 8 in San Antonio, Texas. Board members present were, Eastern Region: Steven Handy, Kate Kirsch, and C. A. "Tony" Lee. Central Region: Kristen Breyer and Harlan Grunden. Western Region: Carol Fletcher, Mari Sanderson, and Terri Sturm. Missing was Central Region Director Vicki Bennett. Kate Kirsch of Clarence, New York, was re-elected as director for the Eastern Region. Harlan Grunden of Curtis, Nebraska, was re-elected as a director for the Central Region. And Mari Sanderson of Norco, California, was elected as a director for the Western Region. In addition, both pending bylaw amendments 4.6 (b) and 4.6 (d) were approved by the membership vote as reported by Survey and Ballot Systems (the official tabulator for AMHA elections). At the annual reorganization meeting held following the Annual Meeting, Mari Sanderson was re-elected by the Board to serve as AMHA President. Harlan Grunden was appointed Vice President and Kate Kirsch was appointed Vice President of Finance. AMHA is pleased to announce the 2019 Breed Promotion Grant recipients. This program was established in 2015 to help organizations with their Morgan horse promotional efforts. The selection committee carefully reviewed each application and applauds everyone's hard work on their submissions. The following awardees will be promoting the Morgan breed to thousands of people across the country! 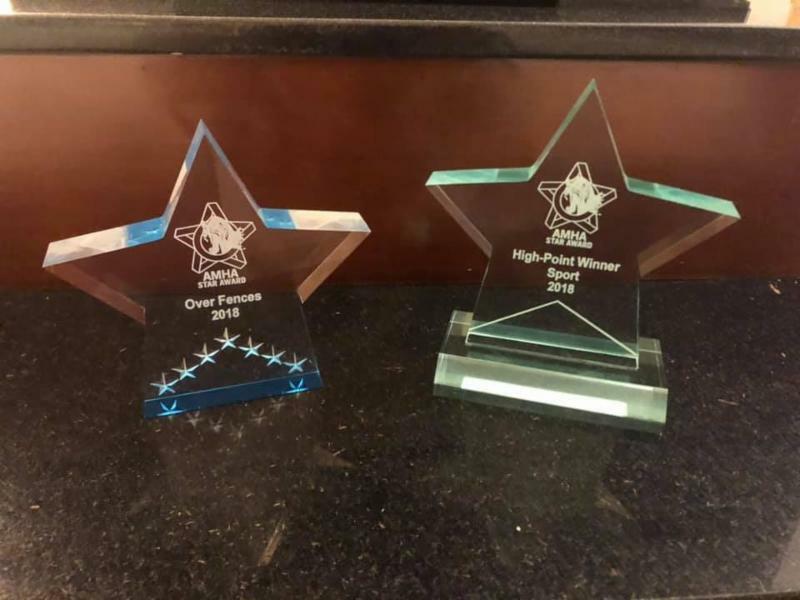 The five Overall Division Award winners for AMHA's Star Awards were announced Saturday, February 9, in San Antonio, Texas, at the AMHA awards banquet, held in conjunction with its annual convention. In its first year, the Star Awards is a free program for AMHA members and was created to increase participation at Morgan competitions, to provide an exciting venue for the awards presentation at the AMHA Convention, and to foster good will and sportsmanship. The 18 divisional awards were presented Friday evening as part of the special "Night Under the Stars" event and only those in attendance were able to vote for their favorites for the overall division awards. To see a complete set of results and points, click on 2018 Star Award Winners. For more information on the AMHA Star Awards Program, contact AMHA Executive Director, Carrie Mortensen, (802) 985-4944, ext. 201, execdir@morganhorse.com. More than $68,000 was earned at the 2019 AMHECT/WMF Stallion Service Auction. This yearly event was held in conjunction with AMHA's annual convention, which took place February 7-9 in San Antonio, Texas. The net income following expenses from this auction go to breed promotion and will be distributed to the World Morgan Futurity, AMHA regional shows, the AMHA Show Grant Program, and AMHA's Marketing and Promotion. For the third year in a row Dragonsmeade Axios topped the stallion bidding, with Daniel Shrock paying $5,600. 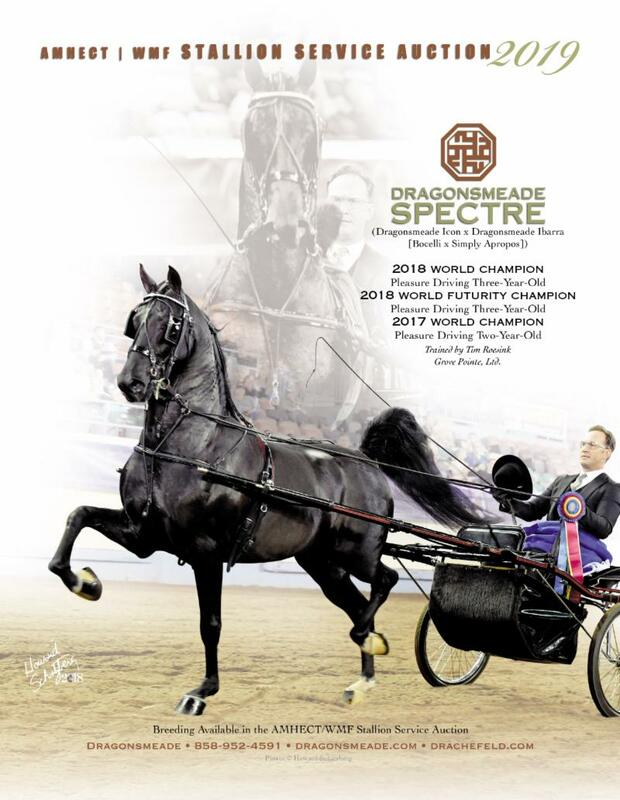 Jay Kleiber purchased the service of Dragonsmeade Spectre for $4,500, and Arcola Farm won the service of Dressed Up GCH for $4,000. Congratulations to these winning bidders and a special thank you to the stallion owners and all who participated! We couldn't do it without you! A complete list of the stallions, winning bidders, and amounts can be found by going to https://www.morganhorse.com/media-events/service-auction/. Below you will find the letter that the Joint Leadership Council submitted to US Equestrian on February 13, 2019. Questions regarding this update should be submitted to AMHA Executive Director, Carrie J. Mortensen at execdir@morganhorse.com.